Monday January 5th 1925 I was busy about home all AM. I had a card from Lydia and wrote to her. I went to town in the Bus and got some more money. Went to Dr Smiths office. paid for my trunk and up to Hatties by street car. spent the night there Tuesday January 6th 1925 My new trunk came over before noon. Ott left on the 1.30 urban car for Cedar Rapids. He goes to Idaho to be gone a week. Hattie & Cora were here awhile. I did the most of my packing. 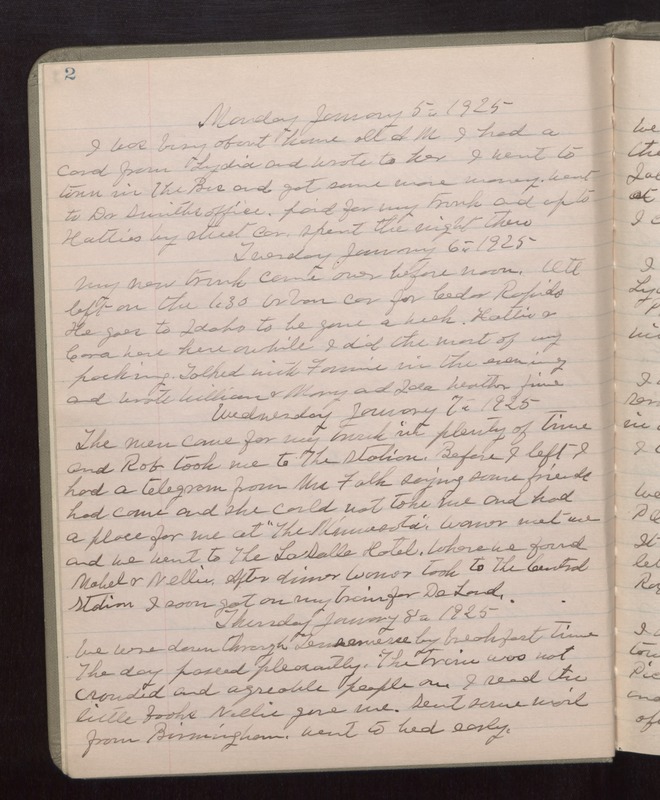 Talked with Fannie in the evening and wrote William & Mary and Ida. Weather fine Wednesday January 7th 1925 The men came for my trunk in plenty of time and Rob took me to the station. Before I left I had a telegram from Ms Falk saying some friends had come and she could not take me and had a place for me at "The Minnesota". Warner met me and we went to the LaSalle Hotel, where he found Mabel & Nellie. After dinner Warner took to the Central Station I soon got on my train for DeLand. Thursday January 8th 1925 We were down through Tennessee by breakfast time. The day passed pleasantly. The train was not crowded and agreable people on. I read the little books Nellie gave me. Sent some mail from Birmingham. Went to bed early.